I come into the possession of original journals and diaries of the Napoleonic Wars via many different routes, but this is the first actually owned by my publisher! Richard Brown of Ken Trotman Books is the owner of this handwritten journal and on a recent visit to see him, he loaned it to me so that I could transcribe and publish it. I had hoped that he might forget I had it, but no such luck! 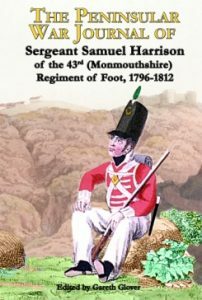 Samuel Harrison was born at Horton in Bradford, Yorkshire in 1780 and initially joined the 1st West York Militia, being hired as a substitute and paid 9 guineas to replace someone who had been drawn from the ballot on 31 December 1795 when he was only 15 years of age. His regiment marched all over the country, being stationed at Peterborough, Colchester, Southampton, Winchester, Hilsea, Ashford, Shoreham, Bexhill, Cork, Manchester, Leeds, Scarborough, Hull, and Leeds again, where the regiment was disbanded on the signing of the Peace of Amiens in 1802. With war being resumed in 1803, Samuel was again hired as a substitute (for a fee of £11) at the town of Harewood near Leeds, this time joining the 2nd West York Militia. Again they travelled the country performing the role of garrisons. The travelled to Hull, Sunderland, Tynemouth, Haddington, Edinburgh, Ramsgate and Chatham, where in September 1807, he volunteered for the regular army and joined the 43rd Foot and was taken on with immediate effect as a Sergeant. I have been unable to discover Samuel Harrison’s service record; however, we do know that he proceeded with the regiment to the peninsular and that he fought at the battles of Vimiero and Corunna, the sieges of Ciudad Rodrigo and Badajoz and the battles of Salamanca, the Pyrenees and the siege of San Sebastian and that he eventually received a General Service Medal with these seven bars when the medal was issued retrospectively in 1848. We also know that he retired from the army and received a pension of 9d per day as a Chelsea out Pensioner from 11 November 1851, living at Halifax, at the age of 71! How he stayed on the books until that age is a mystery, did he act as a storeman, or some other function at the regimental depot? He is also recorded as having died on 12 November 1853 aged 73 and the pension ceased. What is also intriguing is that he states that he served with the regiment as a sergeant, but he was discharged as a private. Was he too fond of the booze, too handy with his fists or not good with the money? Samuel records that he sat down to start writing his journal on 10 June 1844 in two lined notebooks. Unfortunately, we only have the first book which at least identifies him and tells his story until 1812. But, I must qualify this statement. It would appear that it has actually been written by another party, who unfortunately had access to William Napier’s History of the Peninsular War! Indeed, this person has sought to describe the Peninsular War and relates much where the 43rd Foot weren’t even there, or at least when Samuel wasn’t there. But there are glimpses of our man, when he records his direct comments alongside the history he is writing. His many years in the Militia, the retreat to Corunna, his time at Walcheren and his part in the storming of a redoubt at Ciudad Rodrigo are all clearly his own (unvarnished) words. But he also clearly had no recourse to any form of notes and therefore his memory fails him sometimes as to particular persons or dates of occurrences. But for all that, there are glimpses of a soldier who fought for many years in the wars against Napoleon and they still deserve to be preserved. It is a real pity that the journal runs out just as he gets involved in the Siege of Ciudad Rodrigo as he remained in the peninsular for the next two years and saw much fighting and a great deal of marching. It is only hoped that by publishing this journal, we may finally be able to reconnect it with the missing second journal that undoubtedly existed and detailed the rest of his service, but may not name him and may presently lie with a collector unnamed, simply known as that of a sergeant in the 43rd Foot if even that is known. Let’s hope! We do not have a definite birth record, but his Army pension record has him born this year. There are unfortunately a number of Samuel Harrisons in Horton at this time (at least four), but there is only one for that year. This Samuel was baptised on 5 March 1780 at Manningham in Bradford. It could be our man. I have failed to find any burial record.